This morning in Huntington at 7:20AM it’s currently -8 degrees under clear skies. Winds are calm. Relative humidity is 85%, dewpoint -11, barometric pressure 30.75” and rising. We have 20” of snow at the stake. Yesterday’s high was a lovely 21, and the overnight low was -10. High pressure continues to build into the region this morning and will bring us sunny skies this morning, then partly sunny skies this afternoon. Highs will rebound much like they did yesterday into the lower 20s with southwest winds around 10 mph. Tonight should be partly cloudy and less chilly with lows around 4 above with southwest winds around 10 mph until midnight, becoming light and variable. Sunday should start out partly sunny in the morning, then become mostly cloudy with a 40% of snow in the afternoon as a low pressure wave approaches from the Ohio River valley. Highs will be in the upper 20s with south winds around 10 mph. Snow will continue into Sunday night with light snow accumulations on the order of 2-3″ possible. Lows will be around 17 with southwest winds 10 to 15 mph. Chance of snow is 80%. Monday should be cloudy with a 50% chance of lingering snow showers. Highs will be in the upper 20s with northwest winds 15 to 20 mph gusting up to 30 mph. Monday night should be partly cloudy and chilly with lows around zero. Last year on this date we had a high of 17 and a low of -10. We picked up 1.25″ of new snow and had 15″ at the stake. Burlington norms for this date are highs of 34 and lows of 16. The Moon is waxing gibbous, 9d 12h old with 77% illumination. This morning in Huntington at 6:35AM it’s currently -11 degrees under mostly clear skies. Winds are calm. Relative humidity is 84%, dewpoint -15, barometric pressure 30.36” and rising rapidly. We have 20” of snow at the stake. Yesterday’s high was 13, and the overnight low was -11. Arctic high pressure is currently building into the region and will deliver cold and quiet weather through early Sunday. We’ll see partly sunny skies with highs around 12 today with light and variable winds, becoming northwesterly around 10 mph this afternoon. Tonight should be partly cloudy and cold with lows around -3 below with light and variable winds. Saturday should be mostly sunny and a bit milder with highs around 19 and southwest winds around 10 mph. Saturday night should be partly cloudy with lows around 2 above and light and variable winds. Sunday should start out partly sunny, but then become cloudy with a 40% chance of snow as a weak area of low pressure moves in from the Great Lakes. Highs will be in the mid 20s with south winds around 10 mph. Sunday night snow likely with light overnight snow accumulations possible. Lows will be seasonable (haven’t used that word too much this winter…) at around 20. Chance of snow is 70%. Last year on this date we had a high of 22 and a low of -4. We had 14″ of snow on the ground. The Moon is waxing gibbous, 8d 11h old with 68% illumination. 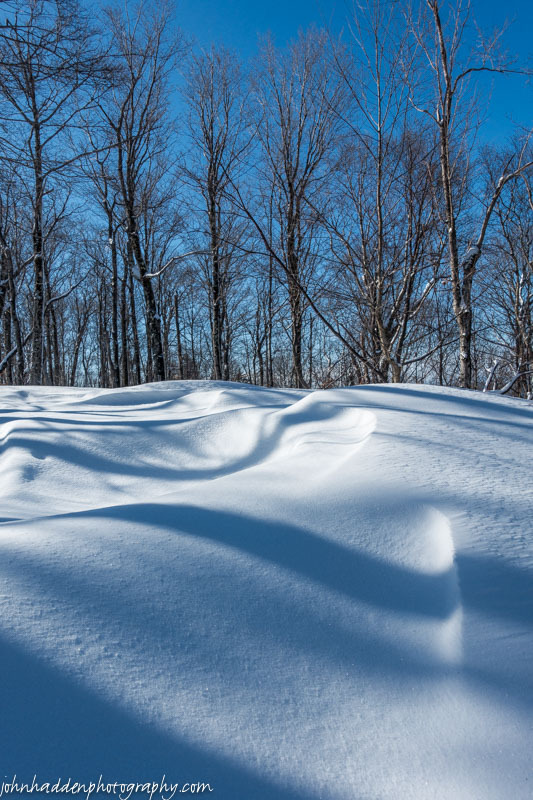 The texture of the snow in the woods is luscious right now. 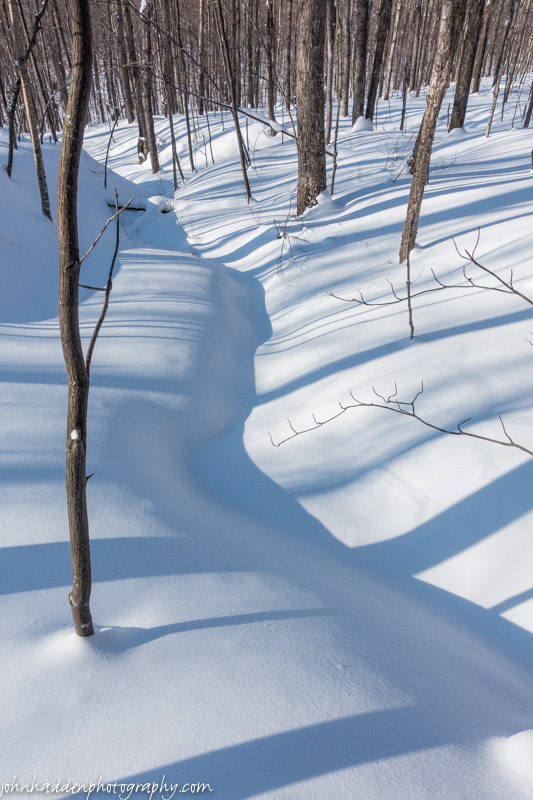 With a good 3 feet of coverage and a creamy texture, it makes for divine backcountry skiing! This morning in Huntington at 8:00AM it’s currently 2 degrees under overcast skies. Winds are calm. Relative humidity is 80%, dewpoint -3, barometric pressure 30.14” and steady. We picked up just the barest dusting of snow in the past 24hrs and have 20” at the stake. Yesterday’s high was 26, and the overnight low was -4. Surface high pressure will ridge over the region today through Saturday night bringing dry weather and below normal temperatures. We’ll see partly sunny skies today with highs only around 9 above with north winds 10 to 15 mph. Tonight should be partly cloudy and cold with lows -2 below to -8 below zero with northwest winds around 10 mph until midnight, becoming light and variable. Friday should be mostly sunny with highs around 10 above and light and variable winds. Friday night should be partly cloudy and cold with lows -5 below to 1 above zero with southwest winds around 10 mph. Saturday’s looking partly sunny and milder with highs around 18 and southwest winds around 10 mph. Saturday night should be mostly clear and cold with lows around zero. Burlington norms for this date are highs of 34 and lows of 15. The Moon is waxing gibbous, 7d 13h old with 59% illumination. 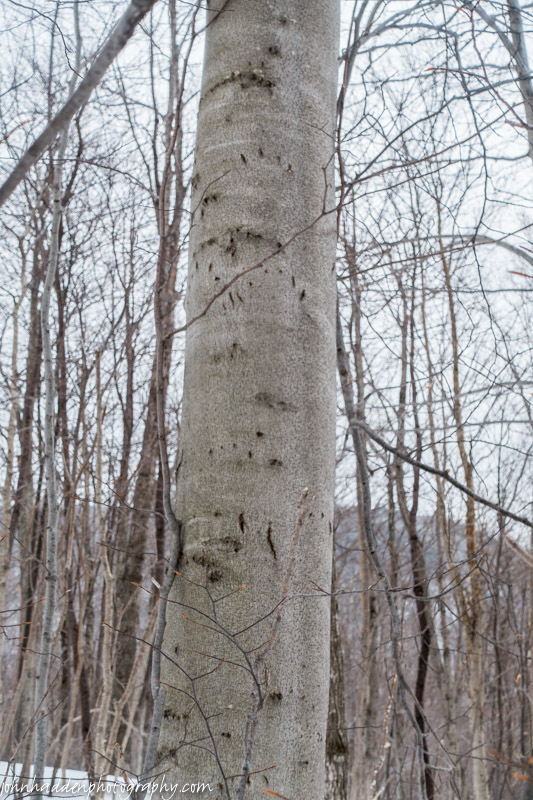 Up near Bald Hill yesterday, I friend and I came across several beech trees that showed evidence of bears climbing to munch on succulent beechnuts. This one was a particularly good example. This morning in Huntington at 6:45AM it’s currently a balmy 15 degrees under overcast skies. Winds are calm. Relative humidity is 70%, dewpoint 7, barometric pressure 29.72” and steady. We have 20.5” of snow at the stake. Yesterday’s high was 18, and the overnight low was 3. An area of low pressure over Quebec will pass north of the region today. The low will drag another Arctic cold front through the region later today along with a chance of snow showers. We’ll see mostly cloudy skies with a 30% chance of snow showers. Highs will be in the lower 20s with south winds around 10 mph, becoming westerly and gusting up to 25 mph this afternoon. Tonight should be partly cloudy and cold once again with lows around -5 below with northwest winds around 10 mph. High pressure will build in Thursday and dominate the weather into the weekend. We’ll see partly sunny skies in the morning, then cloudy skies in the afternoon. It’ll be cold with highs only around 6 above with light and variable winds. Thursday night should be cloudy an cold with lows -1 below to -11 below zero with light and variable winds. Friday’s looking partly sunny and continues cold with highs only around 9 above with light and variable winds. Friday night should be mostly clear with lows around -5 below. Last year on this date we had a high of 17 and a low of 7. We picked dup 1.5″ of new snow and had 14.5″ at the stake. Burlington norms for this date are highs of 33 and lows of 15. The Moon is in its first quarter, 6d 12h old with 48% illumination. A weak ridge of high pressure will crest over the region today bringing partly sunny skies. Winds will become southerly which will allow temperatures to climb into the teens today—a welcome relief. Highs will be around 13 with south winds 10 to 15 mph. An area of low pressure will skirt to our north overnight bringing cloudy skies with a chance of snow showers mainly after midnight. Lows will be around 9 above with south winds 10 to 15 mph gusting up to 25 mph. Chance of snow is 50%. Wednesday should be mostly cloudy with a chance of snow showers mainly in the morning. Highs will be around 19 with southwest winds 10 to 15 mph, becoming westerly in the afternoon. Chance of snow is 50%. The low will drag another cold front though Wednesday night bringing partly cloudy skies and more chilly air with lows -6 below to zero on northwest winds 10 to 15 mph. Thursday’s looking partly sunny and cold with highs only around 5 above with northwest winds around 10 mph. Thursday night should be partly cloudy with lows around -10 below. Last year on this date we had a high of 27 and a low of 16. We had 13.5″ of snow on the ground. The Moon is a waxing crescent, 5d 12h old with 37% illumination. 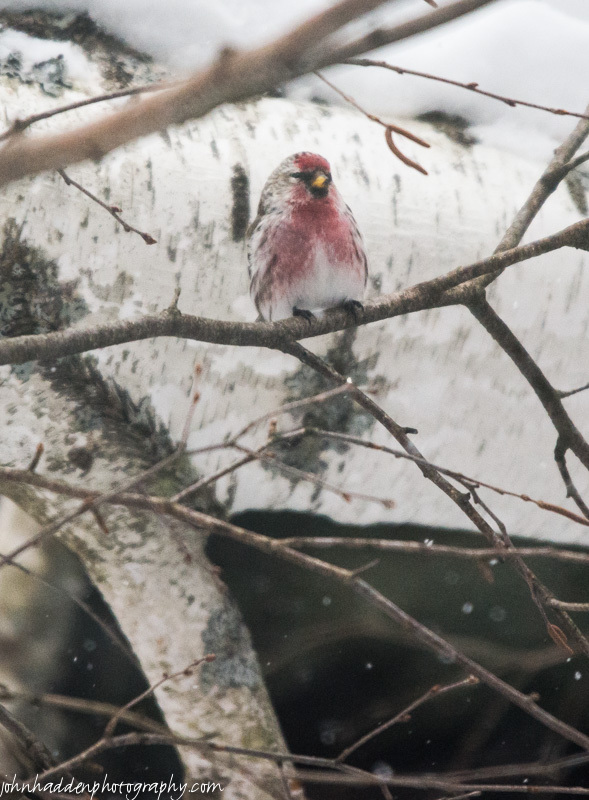 This brilliantly colored redpole caught my eye the other day as he (I’m pretty sure it’s a “he”) was hanging around the feeders with a dozen or so of his compatriots. Maybe it’s just me, but it’s looking like the male birds are getting a bit brighter in anticipation of spring. One can hope! This morning in Huntington at 7:00AM it’s currently 5 degrees under mostly cloudy skies. Winds are out of the southwest at 0-3 mph. Relative humidity is 74%, dewpoint -1, barometric pressure 30.26” and rising rapidly. We picked up a 0.30” dusting of snow overnight and have 22” at the stake. Yesterday’s high was a balmy 34, and the overnight low was 6. There is a Wind Chill Advisory in effect for our region from 3:00PM this afternoon until 9:00AM Tuesday. An Arctic cold front will move across the region today and will once again visit upon us more frigid air. We’ll see mostly cloudy skies with highs topping out at around 5 above this morning then falling to around -4 below this afternoon. Winds will be out of the northwest at 10 to 15 mph gusting up to 25 mph this afternoon. Wind chill values will be as low as 29 below. Tonight will be mostly cloudy and frigid with lows around -15 below with northwest winds 10 to 15 mph, becoming westerly after midnight. The Arctic high will slide to our east Tuesday putting us in a southerly airflow and allowing for temperatures to rebound some. We’ll see mostly cloudy skies with highs around 16 and south winds 10 to 15 mph. Tuesday night should be cloudy with lows around 8 above and south winds 10 to 15 mph. A surface trough will pass to our north on Wednesday bringing cloudy skies and a 40% chance of snow showers. Highs will be in the lower 20s with southwest winds 10 to 15 mph. More cold air will move in behind the trough on Wednesday night bringing partly cloudy with lows -5 below to -10 below zero. Last year on this date we had a high of 45 and a low of 22. We had 13.75″ of snow on the ground. Burlington norms for this date are highs of 33 and lows of 14. The Moon is a waxing crescent, 4d 12h old with 27% illumination. As I walked up our walkway yesterday afternoon coming back from a ski, I caught the movement of a larger critter flying out of the hemlock by the feeder. 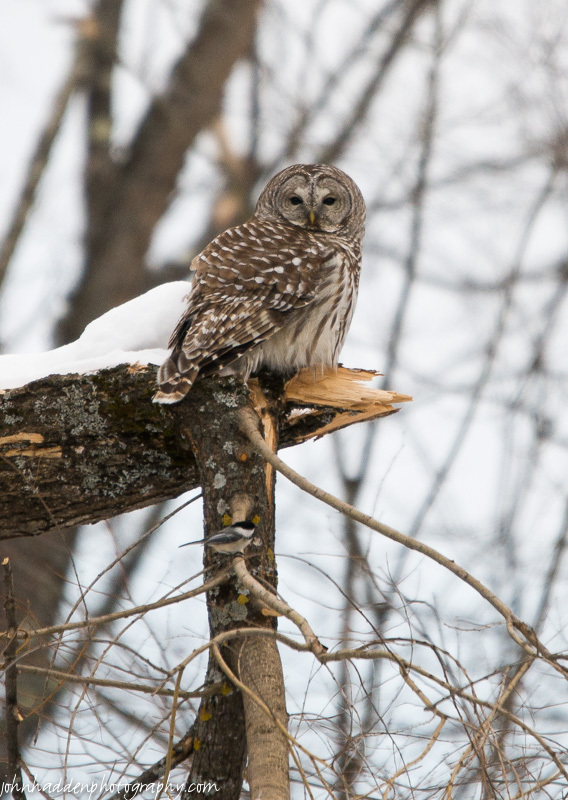 Sure enough, it was this barred owl lurking about looking for a meal. It flew up into the top of one of our now broken willow trees by the pond. Note the chickadee in the branch just below the owl. 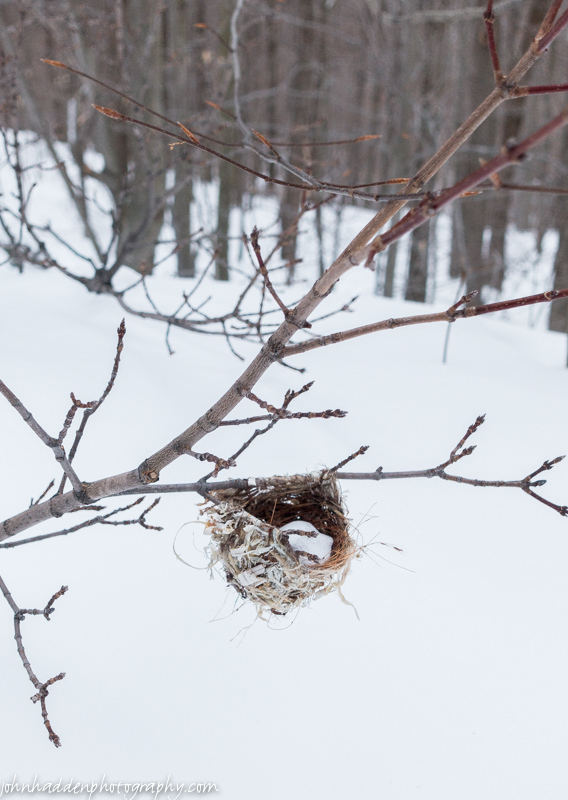 Chickadees like to know where the predators are, and will stay close and even harass them as a warning to other birds. Just another reason I love chickadees so much! The owl was nice enough to wait for me as I went inside and grabbed my camera. 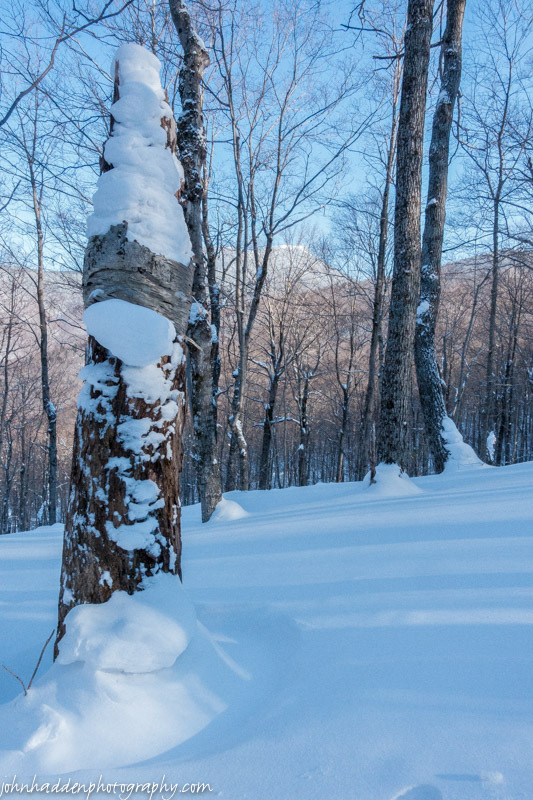 Deep snow, drifting, and Camel’s Hump through the trees. This morning in Huntington at 8:30AM it’s currently 20 degrees and snizzling lightly under overcast skies. Winds are calm. Relative humidity is 94%, dewpoint 18, barometric pressure 30.17” and rising. We picked up 2.50” of new snow in the past 24hrs and have 22” at the stake. Yesterday’s high was 23 (at midnight) and the overnight low was 8. A warm southerly airflow out ahead of the next blast of cold Arctic high pressure will help to push temperatures up into the low 30s today. We’ll see partly sunny skies with a 20% chance of snow showers this afternoon. Highs will be in the lower 30s with light and variable winds. The cold front will move through overnight with mostly cloudy skies and lows around -3 below with west winds 10 to 15 mph. Monday should be partly sunny with highs only around 3 above with northwest winds 15 to 20 mph gusting up to 30 mph. Wind chill values could be as low as -27 below. Monday night will be partly cloudy and cold with lows around -12 below and west winds 10 to 15 mph. Tuesday’s looking mostly cloudy and tad milder with highs around 15 and south winds 10 to 15 mph gusting up to 25 mph. Tuesday night should be mostly cloudy with a 30% chance of snow showers as a clipper system slides by to our north. Lows will be around 10 above. Last year on this date we had a high of 44 and a low of 24. We picked up 0.50″ of rain and had 14.5″ at the stake. Burlington norms for this date are highs of 32 and lows of 14. The record high was 61°F in 1981. The record low was -20°F in 1963. The Moon is a waxing crescent, 3d 13h old with 18% illumination. The snow is nearly 3 feet deep up in the hills near Camel’s Hump. This view from the east side of Crow Hill shows the Hump peeking through the trees on a bluebird afternoon.